UN Women Örebro UN Women Sweden United Nations Entity for Gender Equality and the Empowerment of Women Pincus Inger. 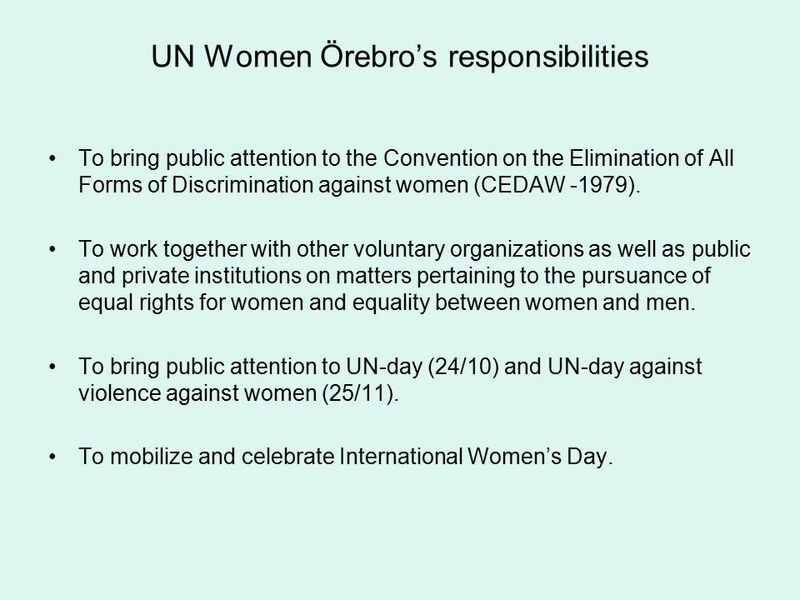 2 UN Women Örebro’s responsibilities To bring public attention to the Convention on the Elimination of All Forms of Discrimination against women (CEDAW -1979). To work together with other voluntary organizations as well as public and private institutions on matters pertaining to the pursuance of equal rights for women and equality between women and men. To bring public attention to UN-day (24/10) and UN-day against violence against women (25/11). To mobilize and celebrate International Women’s Day. 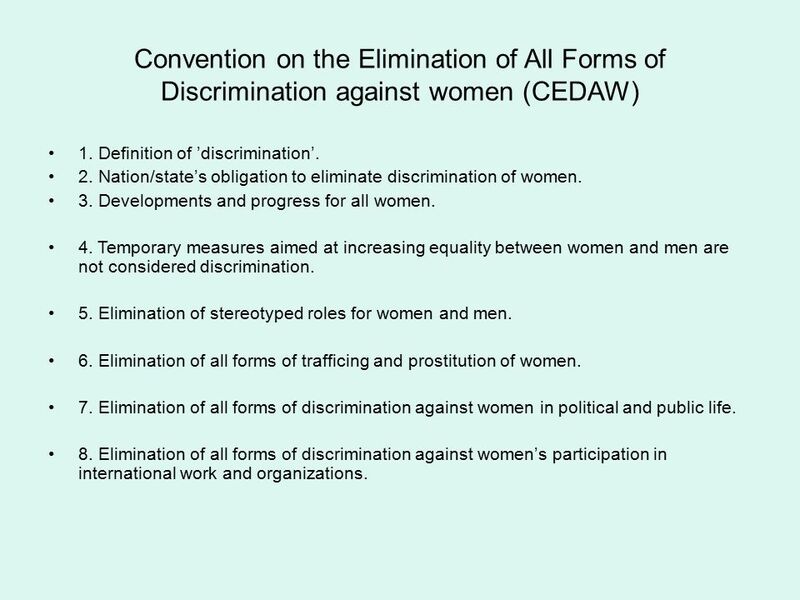 3 Convention on the Elimination of All Forms of Discrimination against women (CEDAW) 1. Definition of ’discrimination’. 2. Nation/state’s obligation to eliminate discrimination of women. 3. Developments and progress for all women. 4. Temporary measures aimed at increasing equality between women and men are not considered discrimination. 5. Elimination of stereotyped roles for women and men. 6. Elimination of all forms of trafficing and prostitution of women. 7. Elimination of all forms of discrimination against women in political and public life. 8. Elimination of all forms of discrimination against women’s participation in international work and organizations. 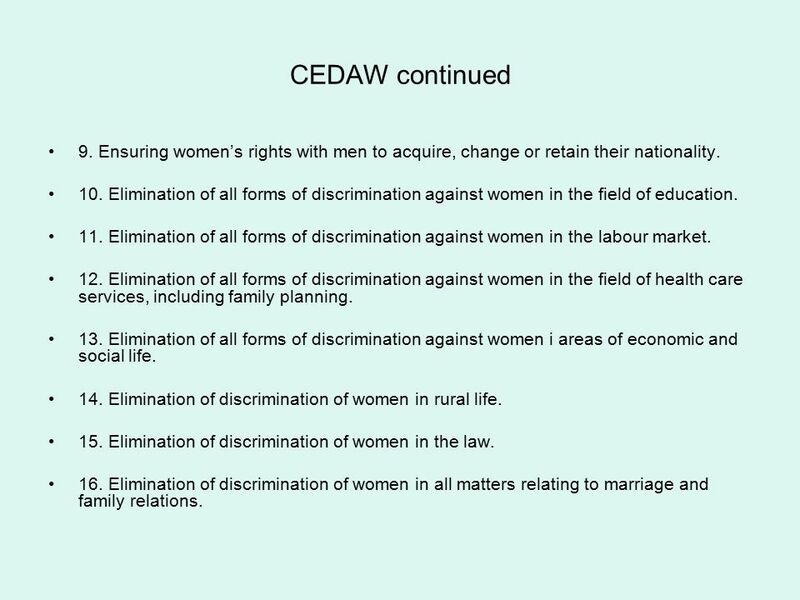 4 CEDAW continued 9. Ensuring women’s rights with men to acquire, change or retain their nationality. 10. Elimination of all forms of discrimination against women in the field of education. 11. Elimination of all forms of discrimination against women in the labour market. 12. Elimination of all forms of discrimination against women in the field of health care services, including family planning. 13. Elimination of all forms of discrimination against women i areas of economic and social life. 14. Elimination of discrimination of women in rural life. 15. Elimination of discrimination of women in the law. 16. Elimination of discrimination of women in all matters relating to marriage and family relations. 5 UN Women Örebro’s plans for working with women’s health issues and how we got here. 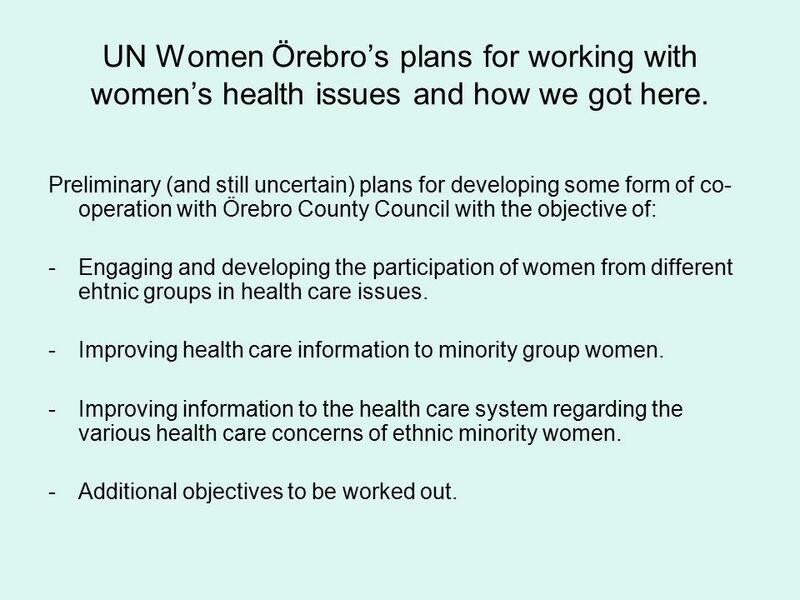 Preliminary (and still uncertain) plans for developing some form of co- operation with Örebro County Council with the objective of: -Engaging and developing the participation of women from different ehtnic groups in health care issues. -Improving health care information to minority group women. -Improving information to the health care system regarding the various health care concerns of ethnic minority women. -Additional objectives to be worked out. 6 Putting our plans to work as of today: Contacting women active in UN Women Örebro and women active in the intercultural network which was established during our two projects: Intercultural network for women in Örebro and Dialog on equal terms. Arranging three lunch meetings (paid for by the County Council) during the spring/fall 2012 to begin discussions on who to involve and how to move forward. Re-starting the work/study group: Health care on equal terms for women and men. 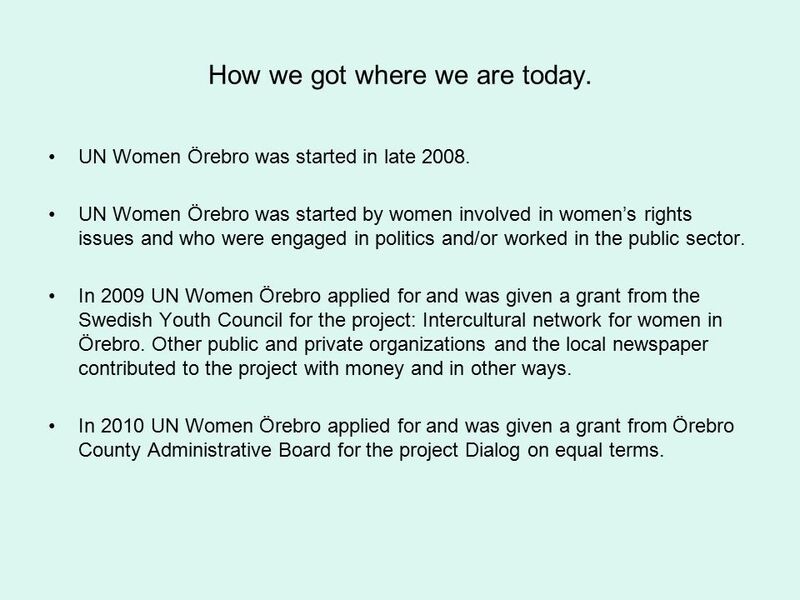 7 What UN Women Örebro has accomplished since it started. 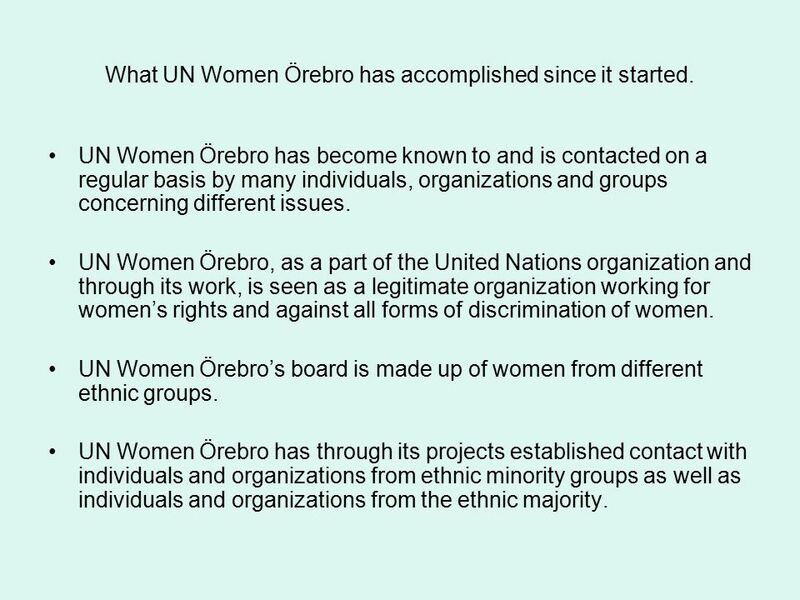 UN Women Örebro has become known to and is contacted on a regular basis by many individuals, organizations and groups concerning different issues. UN Women Örebro, as a part of the United Nations organization and through its work, is seen as a legitimate organization working for women’s rights and against all forms of discrimination of women. UN Women Örebro’s board is made up of women from different ethnic groups. UN Women Örebro has through its projects established contact with individuals and organizations from ethnic minority groups as well as individuals and organizations from the ethnic majority. 8 How we got where we are today. UN Women Örebro was started in late 2008. UN Women Örebro was started by women involved in women’s rights issues and who were engaged in politics and/or worked in the public sector. 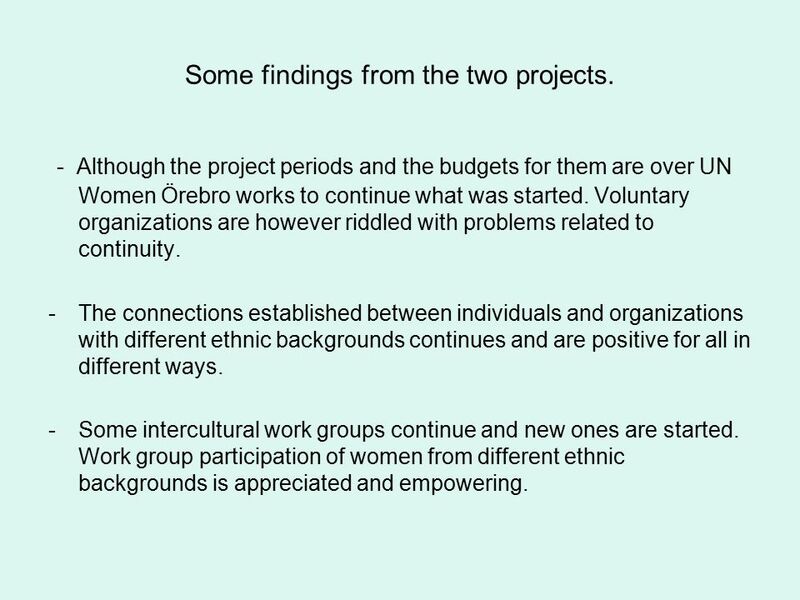 In 2009 UN Women Örebro applied for and was given a grant from the Swedish Youth Council for the project: Intercultural network for women in Örebro. Other public and private organizations and the local newspaper contributed to the project with money and in other ways. 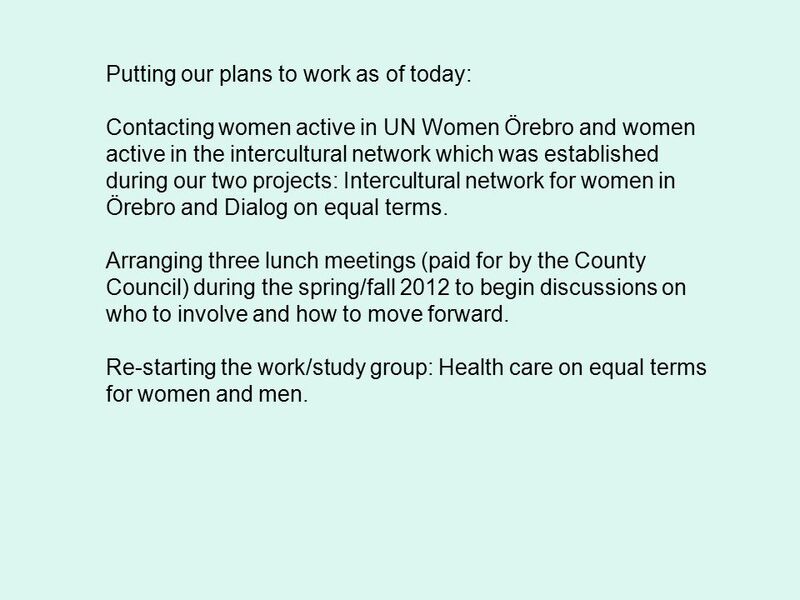 In 2010 UN Women Örebro applied for and was given a grant from Örebro County Administrative Board for the project Dialog on equal terms. 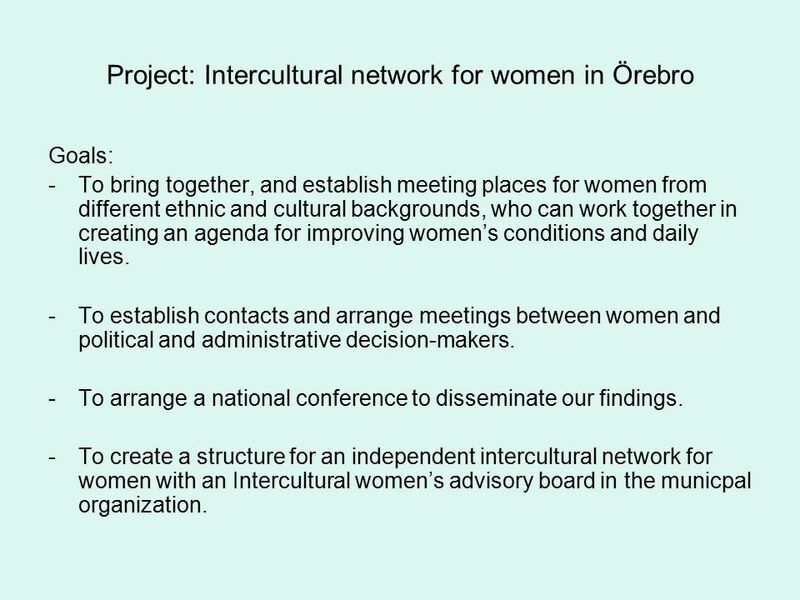 9 Project: Intercultural network for women in Örebro Goals: -To bring together, and establish meeting places for women from different ethnic and cultural backgrounds, who can work together in creating an agenda for improving women’s conditions and daily lives. -To establish contacts and arrange meetings between women and political and administrative decision-makers. -To arrange a national conference to disseminate our findings. -To create a structure for an independent intercultural network for women with an Intercultural women’s advisory board in the municpal organization. 10 Project: Dialog and participation on equal terms The Dialog project was initiated and built on findings from the Intercultural network project. Many women in different ethnic minority groups lacked knowledge of their rights and could not take part in our educational arrangements concerning women’s rights, our UN Women meetings or our work groups because of language barriers. 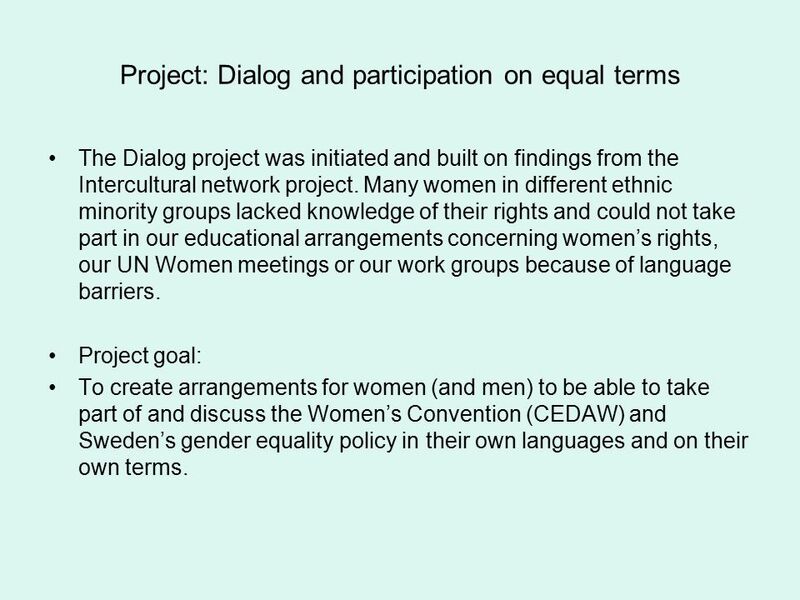 Project goal: To create arrangements for women (and men) to be able to take part of and discuss the Women’s Convention (CEDAW) and Sweden’s gender equality policy in their own languages and on their own terms. 11 The Dialog project in operation. Three language groups were selected: the arabic, kurdian and bosnian. Two project educators from these language groups (from Irac/Kurdistan and Bosnien) were engaged. They were given a course on the Women’s Convention and on presentation techniques. They translated Women Convention documents into the arabic, kurdian and bosnien languages. They contacted a large number of organizations linked to the different language groups. During the fall 2011 they held presentations and led discussions for women and some men in the three different language groups. 12 Some findings from the two projects. - Although the project periods and the budgets for them are over UN Women Örebro works to continue what was started. Voluntary organizations are however riddled with problems related to continuity. -The connections established between individuals and organizations with different ethnic backgrounds continues and are positive for all in different ways. -Some intercultural work groups continue and new ones are started. Work group participation of women from different ethnic backgrounds is appreciated and empowering. 13 Some findings continued. 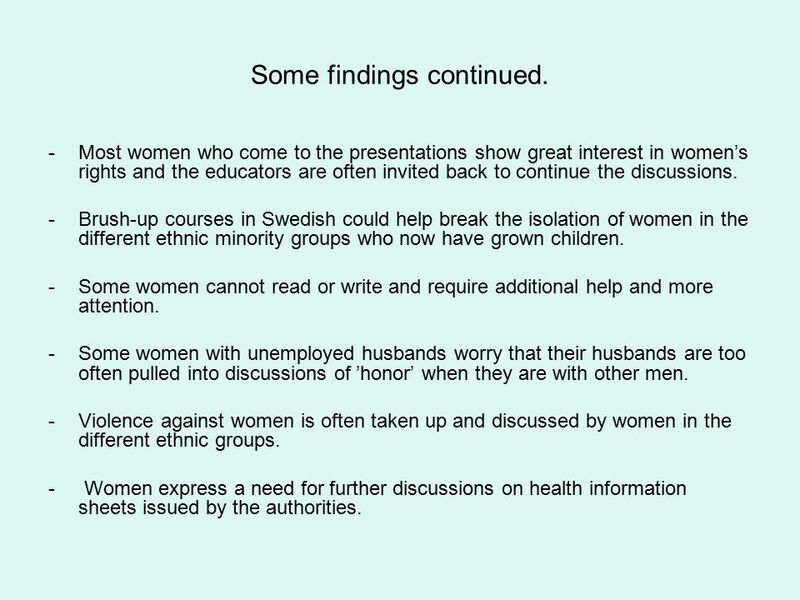 -Most women who come to the presentations show great interest in women’s rights and the educators are often invited back to continue the discussions. -Brush-up courses in Swedish could help break the isolation of women in the different ethnic minority groups who now have grown children. -Some women cannot read or write and require additional help and more attention. -Some women with unemployed husbands worry that their husbands are too often pulled into discussions of ’honor’ when they are with other men. -Violence against women is often taken up and discussed by women in the different ethnic groups. - Women express a need for further discussions on health information sheets issued by the authorities. 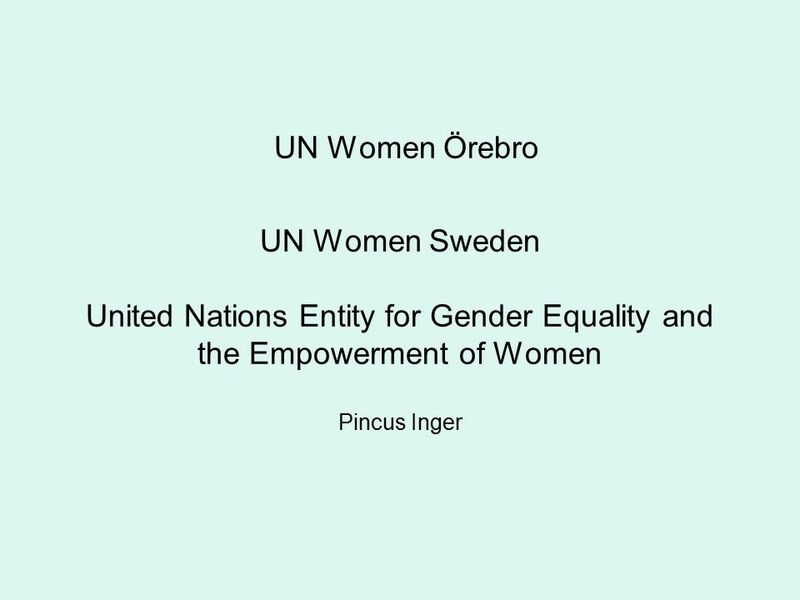 Download ppt "UN Women Örebro UN Women Sweden United Nations Entity for Gender Equality and the Empowerment of Women Pincus Inger." Main objectives Create equal educational conditions for all students independent of social background, gender or ethnic belonging A larger number of students. 1 Finding and Using a Country's Human Rights Obligations to Improve Reproductive Health and HIV/AIDS Outcomes. The Swedish Energy Agency The energy system and the sustainable municipality programme 1 Johan Burström Programme manager. Roma and structural funds in the EU José Manuel Fresno García Member of the High Level Group to promote inclusion of ethnic minorities in the EU. Director. PROJECT Implementation of Gender Mainstreaming into Regional Government and Authorities of Styria Bettina Vollath, Minister for Youth, Women, Family and. 1 Conference on Autonomy and Inclusion Copenhagen 7-8 June 2012 The rights of persons with disabilities to make choices about their own lives Kasia Jurczak. Dr. Ulrich Graute United Nations Department of Economic and Social Affairs 4 July 2013, Dakar, Senegal Towards a Post-2015 Agenda for Sustainable Development. 24th of September, 2009 Liudmila Mecajeva, Director of Social Innovation Fund in Lithuania, Project coordinator. Promotion of Gender equality and Diversity. What, when and how? : The context for User-Led Organisations Rich Watts Department of Health January 2010. 1 A Rights-based approach in relief and development (RBA) 1.The international vision 2.Application to Child Rights : the example of Save The Children 3.What. Human Rights WOMEN’S RIGHTS. Introduction to Women’s Rights Examine this website: org/topic/wome ns-rights and select ONE article about.